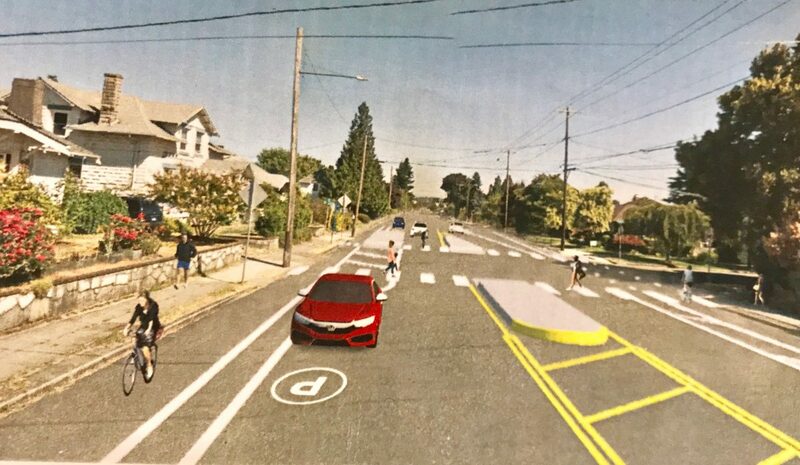 *PBOT conceptual drawings from September showing the original design (on the left) and the modified one created after hearing concerns from some residents. A project that initially proposed parking-protected bike lanes on North Denver Avenue will now get just standard bike lanes. “The project can be delivered with standard bike lanes and curb-tight parking while leaving open the potential to switch to parking-protected bike lanes as part of a future project. That’s the decision made by the Portland Bureau of Transportation after tallying public feedback and responding to concerns in the neighborhood about how the bike lanes would impact their lives. Back in March we shared the original plans for Denver between Lombard and Watts. The idea was use a planned repaving project as an opportunity to create an “all ages and abilities” bikeway that would connect the Arbor Lodge and Kenton neighborhoods. Instead of a bike lane next to moving traffic and parked cars, the proposal would have built curbside bike lanes protected from drivers by a parking lane (similar to what we have on Rosa Parks) The newly designed street would be much safer for all users and it was scheduled to be constructed this past summer. But when the project got to the Kenton Neighborhood Association, PBOT received pushback and opted to delay the project a full year. In a meeting back in September to allay concerns, garner feedback, and consider other options, PBOT Project Manager Geren Shankar characterized the neighborhood opposition as: confusion over where to place trash cans, how the new design might impact driving, and complaints about inadequate public outreach. At that time the plan was to take a survey and get as much feedback as possible then tally the responses and make a decision. The choices were: A parking-protected bike lane or a standard bike lane. In a letter being sent to Kenton neighbors today, PBOT says their choice is a standard bike lane. “We initially proposed repaving N Denver Avenue this past summer with protected bike lanes, transit stops and crossing medians. We received positive support, but also heard some concerns about the proposed design and placed the project on hold to continue our outreach with the neighborhood. Outreach included a direct mailing, an online survey, a presentation at a meeting of the Kenton Neighborhood Association, and a public open house held on October 2, 2018. 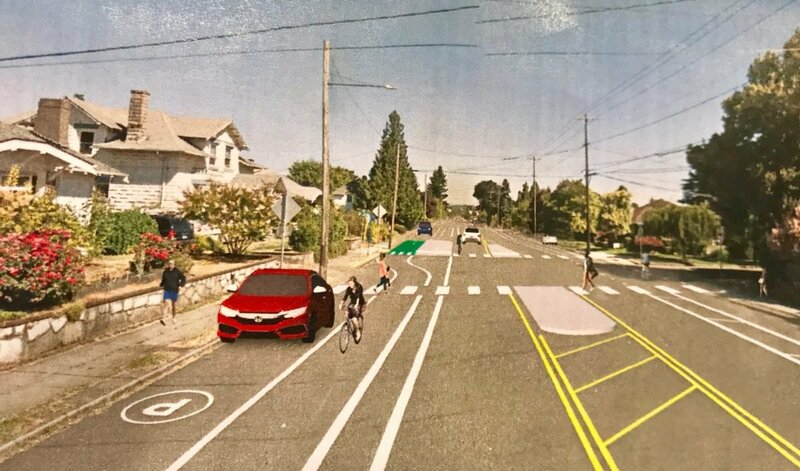 The post City relents to neighborhood concerns, will stripe unprotected bike lanes on N Denver appeared first on BikePortland.org.